Wastewater from all plumbing fixtures drains runs out of your house into the septic tank, part of your septic system. Waste that leaves your house ends up in your septic tank as…sludge, scum or effluent. 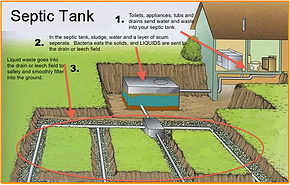 The septic tank is a buried, water-tight container that’s usually made of concrete, fiberglass, or polyethylene. Its job is to hold the wastewater long enough to allow heavy solids to settle down to the bottom forming sludge, while the oil and grease floats to the top as scum. Systems constructed before 1980ish usually are single compartment tanks. Those installed after 1980 are usually two compartment tanks. This is important to know when having the septic tank pumped, as both compartments of a two-compartment tank need to be pumped. Compartments and a T-shaped outlet(sanitary tee) prevent the sludge and scum from leaving the tank and traveling into the drainfield area. Solids that are not decomposed remain in the septic tank and settle to the bottom (sludge). If they are not removed by periodic pumping, solids continue to accumulate until they over-flow into the drainfield. This eventually leads to drainfield plugging and drainfield failure. The first signs may be slow draining fixtures, however the system may fail by discharging sewage effluent to the ground or back-up into the house as well. The liquid wastewater (referred to as effluent) then exits the tank into the drain field. The drain field is where liquid from the septic tank flows through pipes in your yard for final treatment by organisms in the soil. The drain field provides a large area where bacteria can thrive and treated water can seep into the ground. Holes in the drain field pipe allow effluent to seep into surrounding gravel. The soil accepts, treats, and disperses… wastewater as it percolates through the soil, ultimately discharging to groundwater. Your yard should have a “reserve area” which is where your replacement drainfield will be located if your drainfield fails. Don’t park cars and trucks on the drain field or septic tank. Also, don’t install driveways, patios, carports, decks, storage sheds, sports courts, landscaping plastic, and/or allow animals to graze. These activities pack soil and may lead to pipes breaking. What’s TerraLift and What Can It Do for My Septic System?